Ancient Native American stone turtle effigies - throughout our woods. Stone effigies are among the numerous markers left by the inhabitants of our continent's distant past. Here where we are (central ‪#‎Pennsylvania‬), there are several of these stone "turtle" effigies - enduring through the lapse time. The exact tribe who sculpted these is undetermined; but it is historically recorded that major native trails went right through these woods. They remain protected today so that they may continue as reminders for the future generations - of the people long before us, and of their respect for the earth we are all created from. Years ago during my quest for viable off-grid & emergency power sources, I came upon a bicycle mounted electric generator. I don’t recall the company that was marketing it at that time; but I remember it clearly resembling the structure of an exercise bike with an alternator of sorts geared in. The kit included the bike, generator, and an optional deep cycle battery/jump pack to keep charged with it. In all it ran around $600 (which even today is a sizable investment for most average folks – including myself). / While tempting at that time, I declined to make the purchase and went back to intensive research on solar cells, wind turbines, and other experimental power sources that each lacked that desired confidence in having electricity when it counts. Fast forward to now…my revived search for a reliable human-powered generator has led me to K-TOR. An all-American company, K-TOR specializes in pure quality human-powered generators. Having already tested and added their Pocket Socket 2 to my go-everywhere survival kit, I decided to give their Power Box a tryout as well. -Design: Right off out of the box, this generator surprised me with its solid & study – yet lightweight design. (Just in the past 2 month’s testing alone, I’ve put it through periods of intense heat, rain, rugged terrain, unprotected exposure to the elements, a topple down the stairs, plus hours of pedaling) It folds easily in a matter of seconds and can conveniently fit in a backpack, utility box, carry-on luggage, or virtually any mobile space in which one might want its capability standing by. The Power Box can be placed on the ground and used freely, or it can be screwed down to a solid surface if designed in a more permanent station. -Versatility: The Power Box includes a universal plug outlet which can accommodate most standard international plug types. (As a frequent oversees traveler, I much look forward to using this on upcoming trips when we’re in places where electricity is intermittent at best!) Able to power up to 20 watts, one can attach a multi-plug outlet adapter and charge (or power) a variety of DC devices all at once. With an optional 12V charger, the Power Box can also be used to charge deep cycle batteries to store for later use. COMBINE these with an AC convertor – one can power an even larger variety of devices. -Calories to Current: The Power Box facilitates the Holy Grail of sustainable energy – the human body! By allowing any able-bodied person to literally turn their calories into current, one never needs to worry about “not” having power available in the event of emergencies, disasters, or necessity. The Power Box provides not only that peace of mind, but also an advantageous opportunity to transform that extra bowl of ice-cream into juice that can be stored in a battery for later use! I combined the Power Box along with a 12v charger, Schumacher 410watt AC convertor, 65ah deep cycle universal battery, and carrying case to create a portable power station. Using solely the Power Box to provide the charge to the battery (which then maintained the charge to the AC convertor), I was able to play both my electric guitar and violin through my 45 watt Marshall amp in isolated, off-grid settings. After four hours of playing & pedaling in the sun, rain, wind, rocky cliffs, coast, forests - the battery still held enough charge to juice the amp. In addition to use in tangent with a battery and AC convertor, I also performed a calorie-to-current workout test with multiple DC devices at once (using a standard multi-outlet adapter). 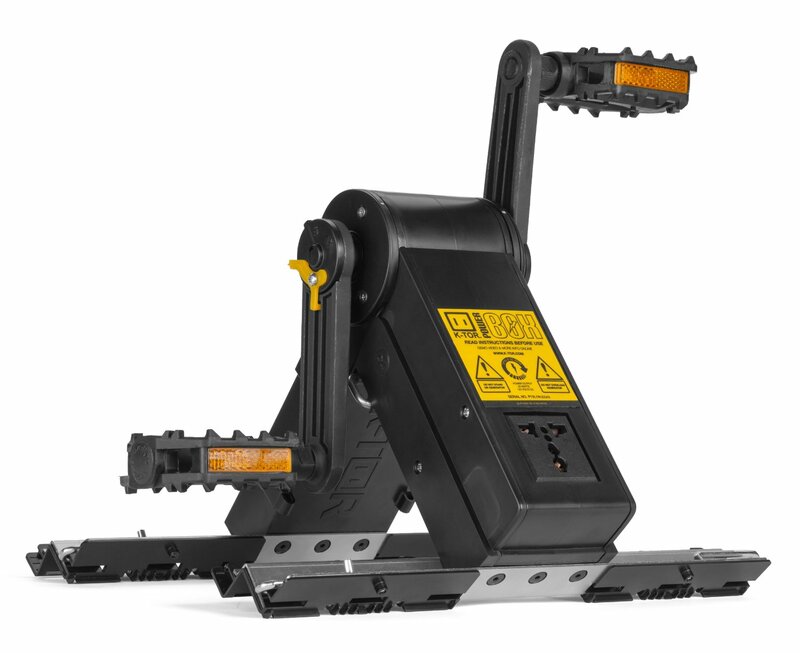 Directly powering four devices as well as running a charger to the deep cycle battery, I confirmed to myself the long awaited excitement of having a pedal unit like this in our off-grid cabin. In regards to the Power Box as an investment of emergency preparedness, survival gear, and an off-gridpower alternative – this unit satisfies and exceeds my expectations. There's no other product comparison that I'm aware of that can touch the portability, solid construction, and capability of this unit as a human-powered (truly) green energy generator. Disclosure: Work'n Man's Life received a used sample Power Box from K-TOR for this review. The opinions expressed in this blog are solely those of author and have in no way been influenced by or reflect those of K-TOR. Off Grid Art Studio/Library complete.